We love animals. It’s one of the main reasons we decided to create Petsies in the first place. And in our continuous effort to bring happiness and comfort to the world, we always look for ways to make a lasting difference on both pets and their human’s lives. It’s but a small gift we can give for the massive love they give us in return. When we think of the word “hero”, our furry friends on the force most definitely come to mind. Along with their human partner, they put their life on the line every day to ensure this world is a safer place for us to live in. And we proudly celebrate their loyalty and unconditional love here at Petsies! We donate custom Petsies plushies of retired or fallen K9's to the officers who trained and love them. Our goal is to provide even the slightest bit of comfort to the officer who lost a beautiful soul, and forever honor the brave pup’s sacrifice. 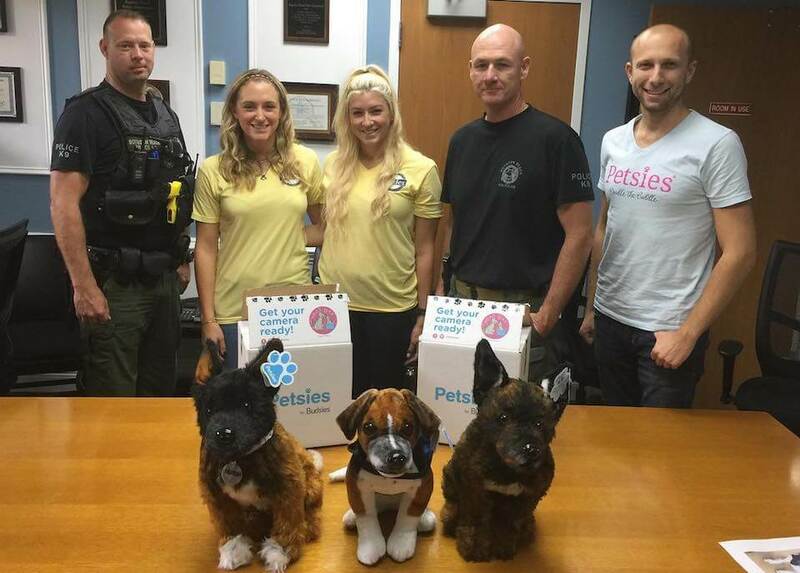 We recently donated Petsies plushies of two retired k9's at the Boynton Beach Police Department. The officer's were overjoyed and couldn't believe the resemblance! We also donated a Petsies plush of the Police Department's service dog for them to take along with them on calls for kids and adults to cuddle. Would you like to be a part of our K9 donation program?